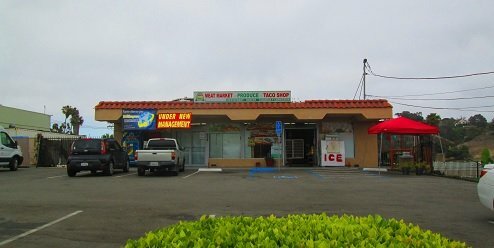 Alex Hughes — June 2018….After going to El Torito Market in West Vista, I started to look toward Oceanside for some good Mexican markets. I came across one by the Crouch Street stop along the Sprinter tracks. I was familiar with the area, but I was hesitant to go. I knew that Crouch Street had its pitfalls and was a little unsafe. I did not feel entirely comfortable considering the very noticeable homeless population. I had one incident in 2016 where I was being shouted out from across the street. I couldn’t wait to leave. Although now that I am older and have explored more neighborhood areas, I decided to give it a try. This location is a small distance from the intersection of Oceanside Blvd and Crouch Street. When you take a look to the right, you will notice an older “shopping center” which really just has a liquor market next to it. The sign has an image of a farm and touts “Mediterranean Restaurant” which I was a little taken aback by. There was not a lot of product on the outside except for an ice box. No brooms! Once I entered, I saw a seating area and limited grocery product. I realized that this was more focused on the freshly made food rather than the market market. No one was there at the time ordering or eating. I took a look at the front shelves and found them in sort a disarray of snacks. There was lots of cookies, drink mixes, nuts and American candies. I was interested in the dates, but I put them down when I saw mold growing in the containers. There were also issues with expiration dates going past due. I have become more lenient, but as a store, it would be best to keep on top of that. A kid was playing around and talking with the cashier as I entered the fresh produce section. There was not much to pick from as most of the fruits and vegetables were not there. There were a few potatoes that had turned green and some onions along with salsa and guacamole. It appeared to be made in store, but I was concerned when I saw that the fridge had previously stored marijuana edibles! I don’t know where they found that fridge! The canned and packaged foods had the same layer of dust that I have seen at other markets. I found interest in some red beans from Goya and some baking soda which had run low. I checked out and was approached by what appeared to be the business owner. He wanted to learn more about my writing and stories and was interested in an article about his store. Well, here it is!